Thunder Game Works has really put together an addicting game with Trenches. 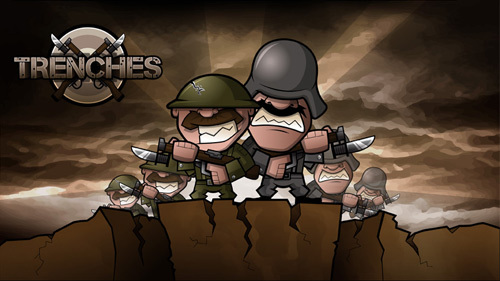 You control the british commandos in your fight against the Germans in this WW1 side view game. The object of the game is to make your way to other side of the map using an arrangement of specialized troops. You can use the trenches to your advantage for protection when fighting against the Germans. Don’t stay holed up too long or the Germans will use Fire Support and wipe out your men. The graphics are well done and adds to the gameplay. The UI is simple and easy to understand. No hunting around hidden menus for game play objects. Everything is kept on one screen for easy access which is less confusing for the player. The music and voice acting are well done. The only gripe with the game is that controlling more than one set of troops becomes a little tricky. Something that will really take this game to the next level is being able to play multiplayer. Overall the game is well done, polished and addicting.